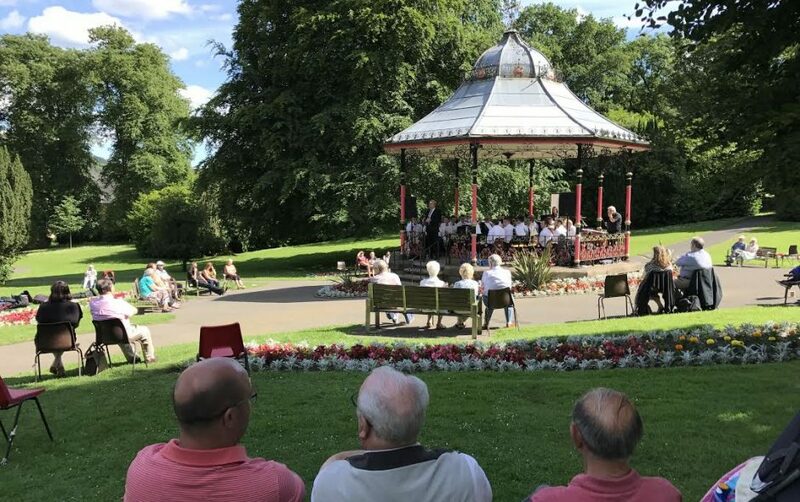 The band’s annual bandstand performance in Tredegar proved to be one of the most successful of recent years - and not just because of the glorious July weather brought a large audience of listeners to Bedwellty Park to enjoying the music making. The concert was the centre piece to the first Aneurin Bevan Day - one that celebrated the life of the great local born politician who went on to create the National Health Service in 1948. In addition to the usual stalls, food outlets and bouncy castle in the fine gardens, there was an also an exhibition about Bevan’s life and achievements, whilst the band itself turned back the clock with a very special performance of a work that was played almost 70 years to the day on the ornate Victorian bandstand. Band President Brian Buckley had recently unearthed a Bedwellty Park bandstand programme played by the then Tredegar Workmen’s Town Band, under the baton of his father Con Buckley on 1st June 1947. Amazingly, Brian was the principal cornet that day, and included in the programme was a performance of the J A Greenwood’s concert work, ‘Cross of Diamonds’. Armed with the information, MD Ian Porthouse and librarian David Thomas delved into the dusty corners of the current band library archive and found the piece - although after decades of storage it was in such a fragile state that it had to be photocopied for the parts to stand upright on the player’s music stands! After playing through it at rehearsal, it was ready for its first public airing in over 70 years – one that thanks to the modern day wonders of social media technology was also broadcast to the world. Ian said: “Being able to unearth music from the band’s past and perform it once again will be a central part of our Lottery Heritage Fund project.